Congratulations, Bethany! (12/12/17): Bethany Huot is the 2017 Hans Kende award recipient. This award is given in recognition of the best dissertation in plant science at MSU within the previous two years. You can read more on the PRL website here. New Publication from the He Lab! (posted 11/27/17): Congratulations to Bethany Huot, Danve Castroverde and André Velásquez from the He Lab on their new publication in Nature Communications. Check it out along with other publications from TPC members on our Publications page. Our study has been promoted by MSU in various ways, including an article by MSU Today, a video put together by the PRL, and an episode on the MSU FoodFix podcast! See below for links to the various stories. Sheng Yang He & Gregg Howe “Most Highly Cited Researchers”! Two of our former TPC PIs have been honored with the designation of highly cited researcher for the third year in a row. Congratulations to them and the many lab members who contributed to the important work in their labs. You can read more on MSU Research page here. Job Posting at Penn State: The Plant Pathology & Environmental Microbiology department at Penn State has a fixed-term job opening for an Online & Short Course Instructor. They are looking for “an Instructor who will work collaboratively with faculty, Cooperative Extension, and a curriculum committee to optimize, envision, create and teach cutting-edge on-line courses. The position will be 70% Curriculum creation and development, and 30% Teaching.” Click here for more information. TPCOnTheRoad! Miranda Haus (Day Lab) is heading to the International Botanical Congress (IBC) in Shenzhen, China where she will present two talks. We look forward to sharing in her experience via Twitter at #TPCOnTheRoad. 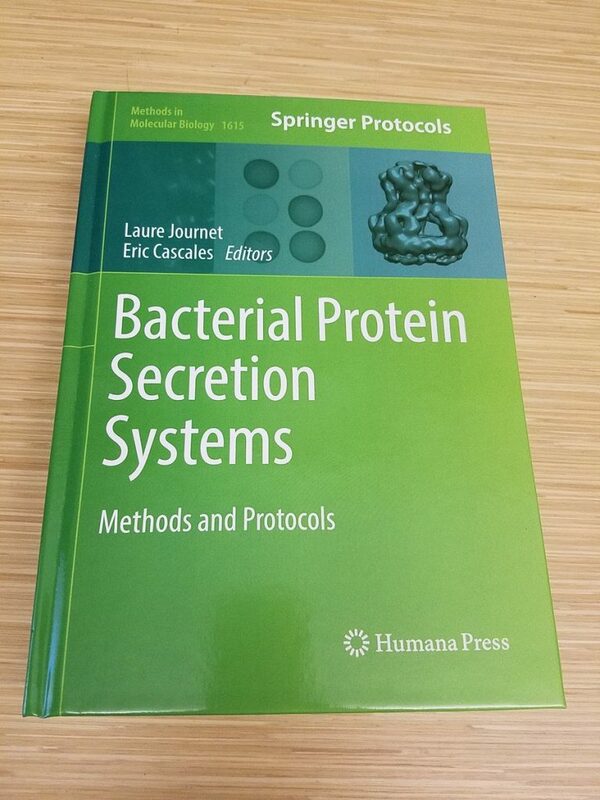 TPC Founder Bethany Huot & TPC Alum Brian Kvitko Published in Springer Protocols – Methods in Molecular Biology. 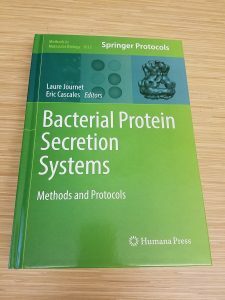 “Measuring bacterial effector translocation into plant cells,” Chapter 33. Find full text here. New Publication from collaboration of two TPC Labs, The Howe Lab & The He Lab: “Regulation of growth–defense balance by the JASMONATE ZIM-DOMAIN (JAZ)-MYC transcriptional module” published in New Phytologist. Click here for full text. The plant hormone jasmonate (JA) promotes the degradation of JASMONATE ZIM-DOMAIN (JAZ) proteins to relieve repression on diverse transcription factors (TFs) that execute JA responses. However, little is known about how combinatorial complexity among JAZ–TF interactions maintains control over myriad aspects of growth, development, reproduction, and immunity. We used loss-of-function mutations to define epistatic interactions within the core JA signaling pathway and to investigate the contribution of MYC TFs to JA responses in Arabidopsis thaliana. Constitutive JA signaling in a jaz quintuple mutant (jazQ) was largely eliminated by mutations that block JA synthesis or perception. Comparison of jazQ and a jazQ myc2 myc3 myc4 octuple mutant validated known functions of MYC2/3/4 in root growth, chlorophyll degradation, and susceptibility to the pathogen Pseudomonas syringae. We found that MYC TFs also control both the enhanced resistance of jazQ leaves to insect herbivory and restricted leaf growth of jazQ. 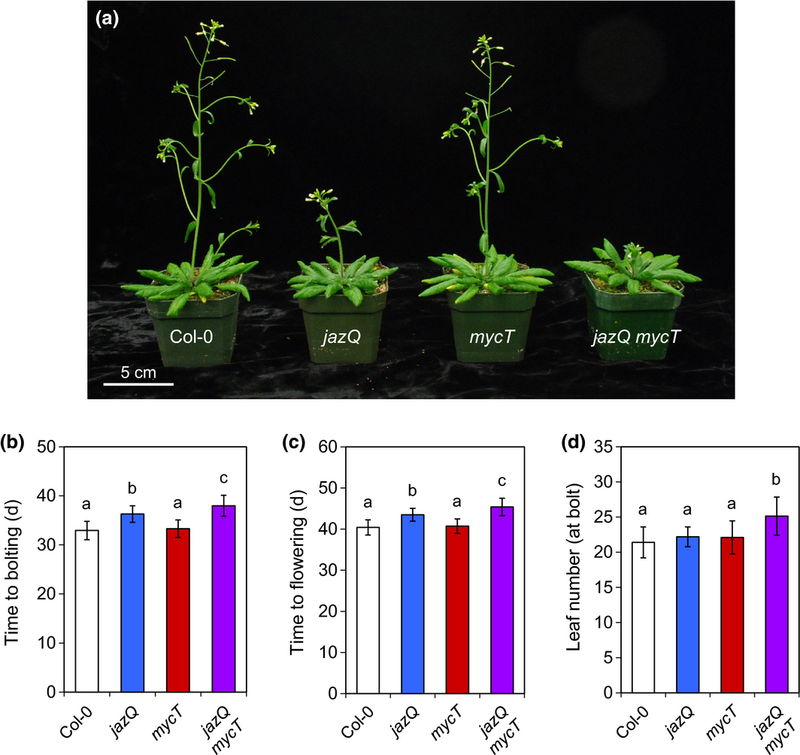 Epistatic transcriptional profiles mirrored these phenotypes and further showed that triterpenoid biosynthetic and glucosinolate catabolic genes are up-regulated in jazQ independently of MYC TFs. Our study highlights the utility of genetic epistasis to unravel the complexities of JAZ–TF interactions and demonstrates that MYC TFs exert master control over a JAZ-repressible transcriptional hierarchy that governs growth–defense balance. New! neuvoo: is a free job search aggregator that indexes jobs directly from companies’ career websites, placement agencies and job boards. They have over 20.000.000 jobs indexed and more than 5 million jobs across the United States, making them the largest job database in the world at the moment. You can search using another region, city, state, industry, etc., and find all relevant jobs. They are present globally, showing jobs from 64 countries in all five continents. There’s also a free ‘take-home’ (after-tax) salary calculator on neuvoo.com and the list of jobs is always being updated. Click on “Job Hunting” under the Resource tab for link. Big Questions in Microbiology (posted 05/23/17): Sheng Yang He recently had an article entitled “Back to the Disease Triangle” featured in Cell Voices. Congratulations, Sheng Yang! New Publications by TPC members! (posted 04/25/17): Check out The Publications page to see new papers published by our TPC members. Congratulations to all! Congratulations to Gregg Howe (posted 04/24/17): One of our TPC PIs, Gregg Howe, has recently been awarded both the Innovation Center Award from MSU and a Fellow of ASPB award. Check out the video below to hear Gregg describe the research led by Marcelo Campos, a former PhD student in his lab, that resulted in a discovery of plants that can both grow and defend. You can also read about it on the PRL’s website. Fascination of Plants day (posted 04/04/17): This year the MSU plant research community is coming together to participate in Fascination of Plants Day. To get more information on how you can participate, contact Anso Bohrer (bohreras@msu.edu). MSU Graduate School Workshops (posted 04/04/17): April workshops available through the Graduate School include topics such as time management, writing, and teaching. Registration is required! Click here for more details. Congratulations to Amy! (posted 03/21/17): Congratulations to Amy Baetsen-Young (Day Lab) on her recent provisional patent for her nano technology. This is a huge accomplishment! New Publication from TPC! 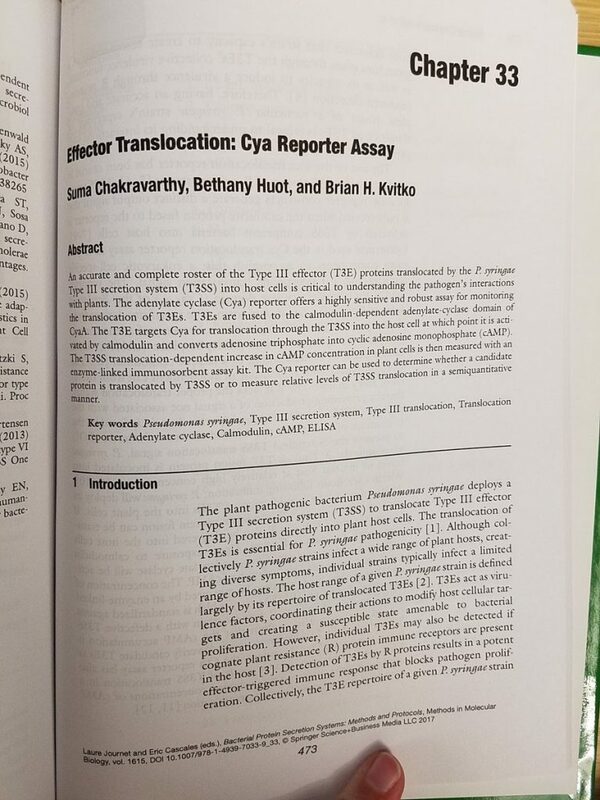 (posted 03/21/17): Congratulations to André Velásquez and Bethany Huot from the He Lab on their new publication in New Phytologist. Check it out along with other publications from TPC members on our Publications page. Apply to be a FAST fellow today! (02/07/17): The Future Academic Scholars in Teaching (FAST) program offered by the MSU Graduate School and directed by Dr. Rique Campa, a Mug Club’r and Associate Dean of the Graduate School, is an incredible opportunity to learn and implement scholarly teaching. Applications are due March 20, 2017. To find out more, including how to apply, click here. Upcoming Workshops to Develop Diverse Skills (02/07/17): Click here to check out these upcoming workshops offered by the MSU Career Center, the MSU Graduate School and the MSU Office of the Vice President of Research and Graduate Studies. There are specific opportunities for Undergraduate Students, Graduate Students and Post docs, so be sure to read all the way down the page to find the ones most relevant to you. Some of these are coming soon and require registration, so don’t delay! New Publications by TPC members (01/18/17): Check out The Publications page for new papers by Bing Zhang & Masaki Shimono (Day lab), Kyaw (Joe) Aung & Xiufang Xin (He lab) and Li Zhang (He lab). Congratulations to all! Sheril Kirshenbaum joins The Mug Club (01/24/17): This week at The Pub Club, we have our first Mug Club guest of the semester, Sheril Kirshenbaum. Sheril will help us practice our skill in clearly communicating the Big Ideas of our research. Don’t miss out on this great opportunity to Fill the Void in your science communication skills! Congratulations, Marcelo! (12/12/16): Marcelo Campos is the 2016 Hans Kende award recipient. This award is given in recognition of the best dissertation in plant science, and awardees are selected from the previous two years. You can read more on the PRL website here. Congratulations, Xin et al!!! (11/29/16): Xiufang Xin, Kinya Nomura, Kyaw (Joe) Aung & Andre Velasquez (He lab) have recently published a paper in Nature describing the role of Pst DC3000 bacterial effectors, HopM1 and AvrE, in establishing an “aqueous apoplast,” which is necessary for disease. To read the full article, click here. To read Xiufang’s blog post on the story behind the story, click here. Congratulations, Dr. Bethany Huot!!! (11/22/16): Dr. Bethany Huot (He lab) successfully defended her Dissertation on November 21, 2016. Congratulations, Bethany! Grad Course on Teaching College Science (11/15/16): ISE 870 Teaching College Science is a 2 credit course that introduces participants to the theory and practice of student-centered college teaching. Participants will be able to use an understanding of how people learn, the basics of curriculum design, and a range of teaching and assessment strategies and instructional technology to plan for, teach, and analyze effective science teaching. This course can be a component of the Certification in Teaching College Science and Mathematics, or could be taken as a one-off for a student that wants to enhance their competence in instruction. Students can contact Joyce Parker ( parker@cns.msu.edu ) for further information. Congratulations, Dr. Li Zhang!!! (11/10/16): Dr. Li Zhang (He lab) successfully defended her Dissertation on November 9, 2016. Congratulations, Li! ASPB Travel Awards for Plant Biology 2017 (11/08/16): Applications are open for the ASPB 2017 Women’s Young Investigator Travel Award to attend Plant Biology 2017 which will be held this year in Honolulu, Hawaii from June 24-28, 2017. Applications for this award are due by December 14, 2016. For more information, click here. Chris J Leaver Fellowship for Early Career Scientists (11/08/16): The John Innes Center is offering “a 5-year Fellowship aimed at individuals wanting to start their own research group, and includes a Project Leader salary, funding for a post-doc, and considerable additional resources provided by the Centre.” Applications are due by November 30, 2016. For more information, click here. Fill the Void (11/08/16): The MSU Grad School offers many workshops and seminars to help you develop skills like Time Management, Writing and Teaching. Click here for workshops available Nov 2016. Registration is required for some of these, so don’t delay! Joe Aung Awarded “Pathway to Independence” (10/31/16): Joe Aung (He lab) is a 2016 recipient of the NIH “Pathway to Independence” Award. You can read about Joe’s award, background and future research plans on the Plant Research Laboratory’s website here. Opportunities to Grow your COM (10/25/16): Make that three opportunities to Grow your COM posted this week that need your attention in the next couple of days should you wish to participate. Opportunity #1: Graduate Student Writing Groups, sponsored by the Graduate School. Click here for more information. Your response needed by Wednesday, October 26. Opportunity #2: PLB/COGs-sponsored Chili Cook-off. Click here for more information. Your response needed by Thursday, October 27. Opportunity #3: ASM Teaching Fellow program. Click here for more information. Your application needed by Wednesday, November 2. 10/17/16 – The COM has added another “tool” to the Resources/Job Hunting page of The Hub! As pointed out in our recent post “Tools and Their Uses” a tool unused is guaranteed to produce nothing, so be sure to take a look. AcademicJobsOnline: is a full service online faculty recruiting site for academic institutions worldwide in all disciplines and areas. We offer unique solutions tailored specially for the academic communities’ unique needs. Our system was developed by people working directly in the higher education and it has been used/improved by HR professionals, faculty search committee members, job applicants and reference writers for many years. BIJC back in swing (10/11/16): The Biotic Interactions Journal Club (BIJC) is older than most of us here and is a great way for early career scientists to hone their critical thinking skills. If you are new to the 4th floor or just looking for a good journal club on this topic, contact Xiufang Xin (He lab) or Ian Major (Howe lab) to get added to the email list. Brad Day’s Promotion Seminar! (10/03/16): Brad Day is up for promotion to full professor. As part of the promotion process, he will be giving a special seminar this Thursday. For details, see the calendar event here. ASM Teaching Resources (10/03/16): The American Society of Microbiology (ASM) is offering an online course for graduate students and post docs to guide you in the skill of curriculum design and student engagement. The Application deadline for this year’s course is November 2, 2016. For more details, click here. New Publication from the Howe Lab! (09/26/16): The Howe lab has a new publication in Nature Communications: “Rewiring of jasmonate and phytochrome B signalling uncouples plant growth-defense tradeoffs,” which has been added to The Publications page. The paper has been highlighted on both MSU Today and the PRL website. Congratulations to our TPC members, Marcelo (alum) & Ian (current member). Registration for the 2016 PBHS now Open! (09/26/16): For the full 2016 schedule, visit the PBHS website. or visit The Pub Club Event Calendar. Click here to register by October 17th. CIRTL Resources (09/14/16): The Center for the Integration of Research, Teaching and Learning (CIRTL) has many resources available for those looking to learn and develop the practice of scholarly teaching and learning. Click here for a list of upcoming events, free online courses, webcasts (CIRTLCasts), and online journal clubs (CIRTL Reads). Congratulations to Kyaw Aung! (09/12/16): Kyaw (Joe) Aung (He lab) was recently awarded a NIH K99 career award. Congratulations, Joe! TPC Alum Update (09/12/16): Alyssa Burkhardt (former PhD student, Day lab) is currently a USDA-funded post doc working for Frank Martin “investigating strawberry pathogens with the goal of developing improved diagnostics for detecting strawberry-specific isolates.” Because Alyssa’s long term career goal is “to become a professor at a teaching-intensive university in which I can use my research experience to guide my teaching and design projects for undergraduates,” she recently began teaching as an adjunct professor at Hartnell Community College. Alyssa is strategically managing her career by actively continuing to develop both her research and her teaching skills. To read more about Alyssa, check out her LinkedIn profile here. Pathways to Scientific Teaching Seminar (08/15/16): This seminar course is offered by Diane Ebert-May and is open to graduate students and post docs. This is a great training opportunity for anyone pursuing a career involving teaching. For more information, click here. Post doc position in Mike Blatt’s lab (08/15/16): There is a 3-year post doc position open in Mike Blatt’s lab to work on SAUR proteins and guard cell membrane transport. Check out the lab website here. Closing date for applications is Sept 4th. See the job ad here: Blatt Lab Post doc position. Igor Houwat visits The Pub Club (08/15/16): This Friday, Aug 19th, at The Pub Club we will have the PRL Communications Coordinator, Igor Houwat, coming to meet with us. Hope to see you there. Welcome to new He lab members (08/11/16): Danve Castroverde and Tariq Aftab have recently joined the He lab. Danve is here as a post doc and Tariq will be with us for 10 months as a visiting scholar. Please be sure to introduce yourselves and welcome them to the floor. Farewell to He lab members (08/11/16): Rongzhi Chen and Caleigh Griffin will be departing the He lab this week. Rongzhi has been here as a visiting scholar and will be returning to China. We also said good-bye to Yongfu Qiu, another visiting scholar from China, this past month. Caleigh will be going to vet school here at MSU, so we may still see her around. Congratulations, Adam! (08/04/16): Adam Seroka (He lab) has been awarded a Plant Biotechnology Health and Sustainability Fellowship. To see the announcement on the PRL website, click here. Careers Beyond the Bench is a three-day workshop for graduate students and postdocs who are committed to pursing a non-research-based career. Participants will receive one-to-one mentoring from Ph.D. holders in their field of interest, along with training in preparing for a career shift, specific application documents for positions of interest to them, interview technique, elevator pitches, developing a career plan, and building a persuasive resume. The Pub Club in the spotlight (06/25/16): This week, Igor Houwat, the new communications coordinator for the PRL, wrote a story on The Pub Club. You can check it out here. Looking to TA this Fall? (06/20/16): Applications for the Fall 2016 semester TA Tuition Pool are now open. You can find the link here: https://grad.msu.edu/ under “News.” The application deadline is Friday, July 8 at 5 p.m. The GEU will select which students will receive support from the TA tuition pool. Updated Publications! 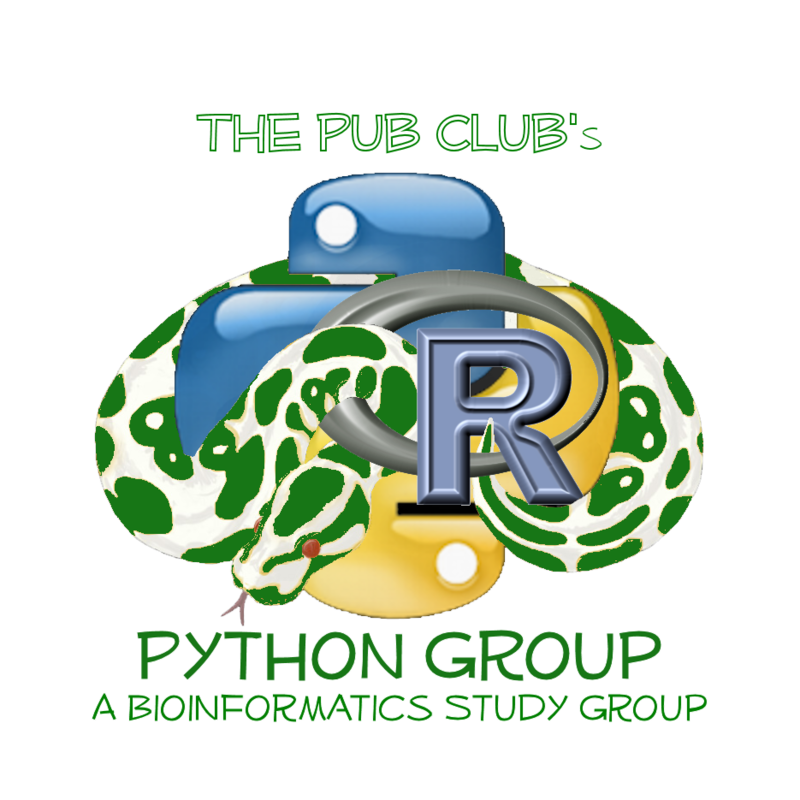 (06/17/16): The Pub Club publications page has been updated. Check it out here or by going to the menu at the top of the site. Congratulations, Li! (06/01/16): Li Zhang in the He lab has just received the 2016 Bessey Best Publication Award. Congratulations, Li! New “Hub Net” Forum (05/30/16): The Hub Net is a new forum page created in response to a mutual desire of our group and Weigel World to continue the interactions initiated during our Skype mini-conference. You can view the forum by clicking on the name (below forums in right hand column of “Hub” page). To participate in this forum, simply register using the “Register” button. As this forum is meant as a tool to promote scientific interactions, please no mattress selling! Welcome to Jenny Mantyla (05/23/16): Jenny Mantyla is the new lab manager for Gregg Howe’s lab. Be sure to welcome her to the 4th floor when you get a chance. Spring BBQ Alert! (05/16/16): Maren Friesen is hosting a get-together at her house in East Lansing this Saturday, May 20th. Check out this week’s newsletter for more details and RSVP link! Li Zhang gets IS-MPMI Travel Award! (05/16/16): Li Zhang of the He lab was awarded a Travel Grant to attend the 2016 IS-MPMI Congress in Portland, Oregon where she will also give a talk to present her research on the scord mutants. Congratulations, Li! Congratulations to Ellie!!! (05/11/16): Ellie Siler of the Friesen lab is now an official PhD candidate. Congratulations! Farewell to Katie Wozniak (04/30/16): Katie Wozniak of the Friesen lab is graduating from MSU and will be heading off to graduate school at the University of Michigan. She has done an excellent job coordinating the Python Group and participating in The Pub Club. We will miss you, Katie, and wish you all the best! Congratulations to Bethany (04/28/16): Bethany Huot of the He lab received a Summer 2016 Dissertation Continuation fellowship from the Graduate School. Congratulations! Congratulations to Alex!!! (04/26/16): Alex Corrion of the Day lab is now an official PhD candidate. Congratulations! Brad Day stars in latest MSU Tomorrow video (04/16/16): See Brad Day in the latest MSU Tomorrow video. 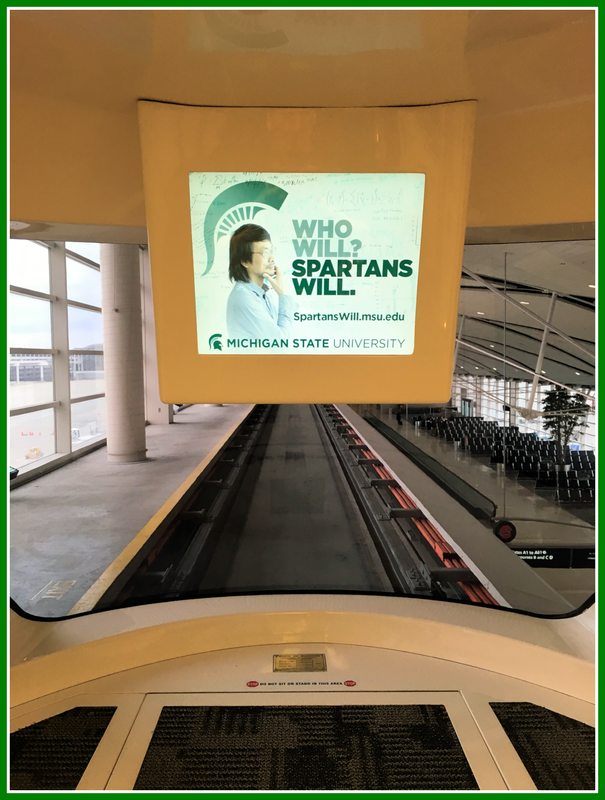 Brad points out that Sheng Yang’s feature video is neither gone nor forgotten as he found out on the tram at DTW. Congratulations to Ian & Li (04/10/16): Ian Major (Howe lab) and Li Zhang (He lab) were the post doc and graduate student Anton Lang award winners this year. Congratulations to both of them! Visitor from Weigel World (04/10/16): Our Arabidopsis hunting friend, Gautam Shirsekar, will be making an appearance at MSU sometime next week. If you happen to be around on the fourth floor when he wanders through, be sure to say hello. Attention MSU Graduate Students! (03/20/16): The Undergraduate Research Office is seeking volunteers to provide constructive feedback to undergraduate students on their research presentations at the 2016 University Undergraduate Research and Arts Forum (UURAF), on Friday, April 8th in the MSU Union. For more information, click here. Special Seminar: Erich Grotewold (03/20/16): This Wednesday Erich Grotewold will give a special seminar. For details, check out the event here. FAST fellow application reminder (03/20/16): Last call for those interested in applying for the FAST fellow program. The deadline for applications is March 21, 2016! Click here for more information. Breakfast with Ian Baldwin! (03/14/16): This Thursday we will have Ian Baldwin visiting us for breakfast and informal discussion. If you would like to participate in this, see Ian Major (Howe lab). Two Special Guests Next Week! (03/07/16): Next week we will have John McDowell and Ian Baldwin visiting us. Please see YiJu Lu or Alex Corrion (Day lab) to sign up for breakfast with John McDowell and Ian Major (Howe lab) to sign up to meet with Ian Baldwin so we can get an accurate head count for food. 14th Annual Plant Science Graduate Student Research Symposium (02/21/16): The call for abstracts is out. Those wanting to participate with a poster or talk should register by March 18th. The Symposium will be held on March 23rd. Don’t miss out on another great opportunity to share your research, network and practice your science communication skills! For more information, click here. Welcome Back! (02/21/16): Shawna Rowe has officially joined the Friesen lab and is back as a regular Pub Club member. In case you didn’t notice, both Shawna and Adam were recruits last year that members of The Pub Club helped recruit to MSU (check out the “Outreach” picture at the top of the page). They are now MSU Graduate students and Pub Club members! New Teaching Resources (02/17/16): Putting together an application for an academic position? Check out the latest teaching resources added to the “Teaching” page under “The Resources.” Links are provided for tips on developing your teaching statement as well as actual teaching resources (CourseSource), information on the “Vision & Change” initiative and communities involved in implementation of Vision and Change (PULSE and PSALSE). Welcome Back (02/15/16): Ryan Corbett is back on the 4th floor, this time as a rotation student in the Howe lab. Also, welcome to Adam Seroka, who is now an official member of the He lab. March Grad School Workshops (02/15/16): The MSU Graduate school offers various workshops each month. Workshops offered in March include writing, teaching, mentoring as well as a creating a professional development plan based on your long term career goals. Check out the details by clicking here. 57th Annual National Student Research Forum (02/15/16): The Annual NRSF is a national Research assembly, planned and managed by students, that showcases research form the fields of biomedical sciences, medical humanities, and public health studies. This year it will be held April 27 – 29th, 2016, and the deadline to submit abstracts is March 1, 2016. You can get more information and/or to submit your abstract at http://www.utmb.edu/nsrf. Job Alert courtesy of Jan Leach (02/15/16): Brad Day passed on this announcement regarding a “Microbiomes Systems” cluster hire at Colorado State University. Deadline for applications is February 28, 2016. Find more information by clicking here. Calling for 2016-2017 FAST Fellow Applications! (02/01/16): Here at The Pub Club we are always looking for great professional development opportunities to help us fill “The Void.” The FAST (Future Academic Scholars in Teaching) program led by Associate Dean of the Graduate School and Mug Club alum, Dr. Rique Campa, is just that sort of opportunity. The emphasis of FAST is to develop educators who approach teaching the same way as we approach our science–as scholars. This is done by designing and conducting a “Teaching As Research” project in collaboration with a faculty mentor. Interested? Click here for more information. Check it Out! (02/01/16): The Jan/Feb issue of ASPB News features an article written by Bethany Huot on The PRL’s 50th Anniversary celebration. You can read the article by clicking here. Job Alert! (02/01/16): Koichi Sugimoto would like to alert you to a job opportunity. Here is Koichi’s message: “I just heard that there is open position in Hokkaido University in Japan only for NON-JAPANESE and English-native (near-native) person. Hokkaido University is one of the top 5 universities in Japan, is in one of the biggest cities, Sapporo (ca. 2 million city), and is close to the main station (ca. 5 min walk from Sapporo station). I think it is good for people interested in Japan.” If you would like to know more, click here. IS-MPMI Congress Registration Now Open! (02/01/16): Don’t forget to register for the bi-annual IS-MPMI Congress, held this July in Portland, Oregon. Meetings are one of the best opportunities for networking and sharing your science. Also, don’t be shy! When you submit your abstract to whichever meeting you may attend this year, sign up to be considered for a talk in addition to presenting a poster. New Scoop.it Pages added (01/24/16): Want a quick, easy way to find the latest publications on research areas of highest interest to you? Check out the new Scoop.it pages (link under “The Publications”). Have a Scoop.it page you would like to share? Share it via the Whiteboard or Twitter (@ThePubClub). Updates to 2016 Conferences (01/24/16): The 2016 Conferences post, which you will find on The Whiteboard, has been updated again with registration and abstract submission deadlines for Plant Biology 2016, the Phytobiomes meeting and now IS-MPMI deadlines. If you find additional meetings you would like to share with the group or find updated information, please share it by using the comment box below the post. Special Seminar Series Alert! (01/24/16): The Global Impact Initiative Quantitative & Computational Plant Science Cluster Hire Candidate Seminar series will run from January 20th to March 2nd of 2016. These special seminars are not only a good way to here from experts in the Plant Science community, but also provide an opportunity to learn how to give a “job talk.” You will not want to miss out! To see the full list of seminars, click Global Initiative Cluster Hire Seminars. You can also find seminar information on the Events calendar. Gregg Howe Investiture as MSU Foundation Professor (01/19/16): This coming Monday, January 25, 2016, Gregg Howe will be honored along with Chemistry Professor, Marcos Dantus, with the designation of MSU Foundation Professor. These “professorships are part of an initiative to attract and retain highly successful faculty members. Each of the recipients receives five years of supplemental research support and holds the MSU Foundation Professor designation permanently.” Congratulations, Gregg! MSU Graduate School Feb Career Workshops (01/18/16): The MSU Graduate School offers many different workshops to help you during the process of your PhD and post doc. Check out the MSU Graduate School Workshops in Feb 2016 post for details. 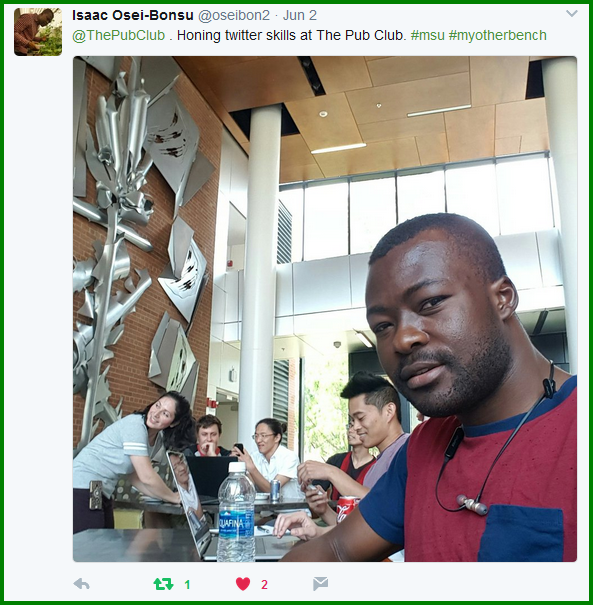 Postdoctoral Enhancement Awards for Teaching (PEAT; 12/15/15): As Rique Campa shared with us when he visited The Pub Club, there is a new teaching program for postdocs at MSU. For details on this program and information on how to apply, click here. Teaching College Science (ISE 870; 12/15/15): Another teaching resource here at MSU. ISE870 is a “2 credit course that introduces participants to the theory and practice of student-centered college teaching. Students will be able to use an understanding of how people learn, the basics of curriculum design, and a range of teaching and assessment strategies and instructional technology to plan for, teach, and analyze effective science teaching. This course can be a component of the Certification in Teaching College Science and Mathematics, or could be taken as a one-off for a student that wants to enhance their competence in instruction. Students can contact Joyce Parker ( parker@cns.msu.edu ) for further information. Online Teaching Course by Trinity College (12/07/15): From the ASPB Twitter feed: “Free, 4-week professional dev course: Effective Teaching Strategies for College Biology. Starts 1/5/16.” Register here. Welcome to Katerina Lay (12/01/15)! 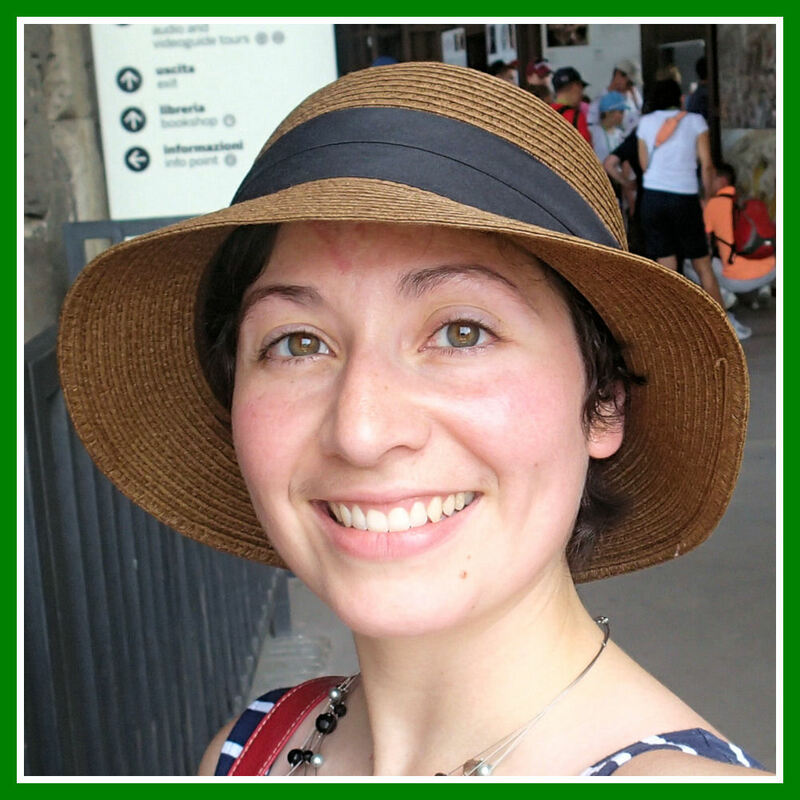 Katerina is a graduate student currently rotating in the Howe lab and will then do her next rotation in the He lab. Please take a minute to welcome her to the 4th floor MPS community! Introduction to Computational Science (NSC 801; 11/25/15): This is a new course offered this Spring 2016 open to all MSU graduate students. “The objective of this course is to teach you to write computer programs to manipulate and visualize data, to create numerical models that allow insight into physical, biological and social systems, and above all learn to use the computer as a tool for problem solving. This will be done using examples from a wide variety of subjects, and will use the Python programming language and a variety of standard libraries and tools. The skills that you learn in this class will be useful in your research and in other courses, and are also highly valued by employers!” For more information: NSC_801_flyer. Scholarly Communications in the Digital Age (EAD 991B; 11/21/15): This is a new online course being offered this Spring 2016 semester that might be of interest to those of us looking to hone our academic writing skills. Information regarding this course has been shared by the Associate Dean for Graduate Studies in the College of Natural Science, Richard Schwartz. As described by the instructor, Steven Weiland, this course “will guide students toward a critical and selective view of how they can make the best uses of new technologies associated with the system of peer review, journal publication, and ways of circulating scholarly work and registering its impact.” For a full course description, click here. AAAS Mass Media Science & Engineering Fellows Program (11/15/15): Crispin Taylor was in contact again this week and wanted to let us know that applications are now open for the 2016 Media fellows program. Click here for details. Congratulations, Li! 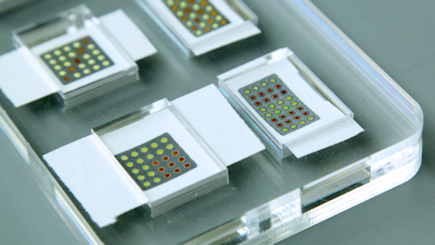 (11/15/15) Li and Sheng Yang were interviewed last week by Popular Science regarding Li’s recent paper in PNAS. To check out the blog, click here. To check out Li’s paper, go to The Publications page. New Papers from Pub Club Members (updated on 11/08/15): Congratulations to all our members who have published over the last year. To see the science being published by people in The Pub Club, check out the new additions on The Publications page. There are a few more papers in press, so be sure to check again in a month or two. Li’s new paper in PNAS was just added this week. To read the paper, check it out on our Scoop.it page. Breakfast with Sarah Lebeis (10/27/15): Sarah Lebeis is the Monday seminar speaker this week and we are scheduled to have breakfast with her Tuesday, October 27th. Click here for the event information. This is another great networking opportunity. Hope you can join us. If you have any questions, contact Ian Major (majori@msu.edu). Guest from Max Planck Institute (10/21/15): Amine Hassani is a PhD student in Paul Schulze-Lefert’s group at the Max Planck Institute for Plant Breeding Research in Cologne, Germany. He will be working with the microbiome group in the He lab for several months. Please take a minute to welcome him to the floor. PRL 50th Anniversary Celebration (10/16-18/15): This week MSU will host plant scientists from around the world in celebration of the PRL’s 50th anniversary. This is a great opportunity for many of us to Build our Networks! Click here for the event schedule. Plant Biotech Symposium Highlights (10/13/15): The Career Development component of the Plant Biotech Symposium gives graduate students and post docs access to scientists in many different types of careers. If you were able to participate and would like to share your thoughts about either the career talks and/or the symposium talks, please feel free to write up a post for The Whiteboard. New Scoop.it page (10/03/15): To better facilitate sharing of papers among The Pub Club, we now have a dedicated “Scoop.it” page. 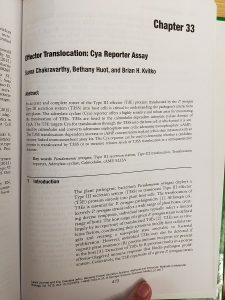 Modifications to this page may occur in the next week as we get it figured out, but feel free to check out the papers we have “scooped” so far, including the Doudna lab CRISPR paper recommended by Tim Whitehead during his visit to The Pub Club. New Website Updates (10/02/15): We have converted the “Sub” Club page into a “Parent” page with individual “Child” pages for each “Sub” Club group. Now it is easier than ever to find the “Sub” group that best fits your research and career development needs! Last week was our first Python Group meeting of the semester! We brainstormed about what we wanted to do this semester. A summary of what we discussed is on The Whiteboard for anyone who missed it. MMG Seminar by Sheng Yang He (9/22/15): It is not often we get the privilege of hearing our own distinguished professors give a talk! For more details on the seminar time/location, click here. Congratulations to Joe (9/21/15)! Joe recently received travel funding to attend The 36th New Phytologist Symposia on “Cell Biology at the Plant-Microbe Interface” in Munich, Germany this Nov/Dec. The award covers Joe’s registration as well as 1500 euros towards his travel costs. New Website Updates (9/13/15): We now have a “Sub” Club page with information on all the small groups/journal clubs here for you to “stay on the edge of science.” This page includes information for Python Group, Writing Group, Biotic Interactions Journal Club (BIJC) and the Microbiome Journal Club. Nice use of social media! Maren recently tweeted her post on writing resulting in 250 views and one comment to her post on our website. Way to go, Maren! For those of you looking to elevate your profile in a competitive job market, this is a great way to do so. New Graduate School Writing Fellowship! The Graduate School at MSU is now offering a $1,000/semester fellowship for graduate students (must have passed your comprehensive exam) who are interested in honing their writing and leadership skills. For more information, click here! Congratulations to Dr. Alyssa Burkhardt (9/8/15)! If you have not yet had the chance, please join us in congratulating Alyssa on the successful completion of her PhD. New Pub Club Writing Group! Chandra Jack is leading a new Writing Group for The Pub Club. The group currently meets Tuesdays at 4 PM in the 2nd floor conference room in MPS. See her post for more information. New “Blackboard” Page! This page has been added in response to our planning discussion at the July 31st, 2015 gathering. Its purpose is to provide a static page comprised of reference content used for planning, scheduling, and operation of The Pub Club. It is password protected to keep the information private to our group, so be sure to check this week’s newsletter for the password! New Resources Added! Several additions have been made to the Resources pages. First, we have added the link for Nature’s statistics for biologists website, Points of Significance to the Bioinformatics (now Bioinformatics & Statistics) page. We have also added a Writing & Peer Review Resources page, which includes some step-by-step guides to peer review and the publon website shared by Brian Kvitko. This page also includes Writing Resources to assist and guide you whether you are writing your thesis or for publication! If you have any good resources you would like to share, please post them on The Whiteboard. News Alert! James Kremer was quoted in a news story on “Underground Immunity” posted this week in The Scientist. Click here to read more. Congratulations! Brian St. Aubin (the Howe lab) was awarded a two-year fellowship through the Plant Biotechnology for Health and Sustainability Training Program. For students interested in applying for this fellowship next year, click here for more information. Check it Out! We have a new Pub Club poster that is now on display both on the fourth floor of MPS and in the main PRL hallway in the Plant Biology Building. ASM Update James Kremer and Brian Kvitko shared their experience at the 2015 ASM Conference with us at last week’s BBQ. Microbiome seemed to be king of the conference this year! James also shared his experience doing a live interview, including questions regarding his position on Chinese herbal tea. If you are interested in checking out his interview, click here. Thanks for taking the time to share! A professor at Michigan State University and a leading plant scientist has been elected to the National Academy of Sciences. Sheng-Yang He, a MSU Distinguished Professor in the MSU-DOE Plant Research Laboratory, Department of Plant Biology, Department of Microbiology and Molecular Genetics, and Department of Plant, Soil and Microbial Sciences, was selected as part of the 2015 class. He earned the honor for his seminal contributions to the understanding of plant-pathogen interactions. The Pub Club expands again! The Pub Club is growing! (04/03/15) We want to welcome the addition of the Bonito lab to The Pub Club. 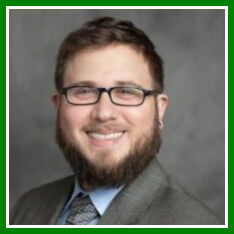 Greg Bonito is a new Assistant Professor in the department of Plant, Soil and Microbial Sciences here at MSU. Greg’s lab studies plant-fungal-bacterial interactions from an ecological and evolutionary perspective. Check out our new “Papers of Interest” Page! Inspired by Sheng Yang He, the “Papers of Interest” page highlights new papers that are of interest to The Pub Club. Please feel free to recommend papers you find by posting them on The Whiteboard. Several publications have been added to The Publications page, which is a compilation of papers produced by members of The Pub Club while members of The Pub Club labs. If you are a Pub Club member and have a paper you would like posted, please send the citation information and URL to alphanode@thepubclubhub.org. For other pubs you think our group might find useful, please submit them on The Whiteboard and we will add them to the “Favorite Pubs” page. Check out our famous Professor Sheng Yang He in his breakout role! Where’s Waldo? Can you spot the time point where the Day Lab appears in the video?